This image, crafted using insider information from Kawasaki, is the best interpretation yet of the supercharged superbike the Japanese firm could use to rip up the class rules next year. 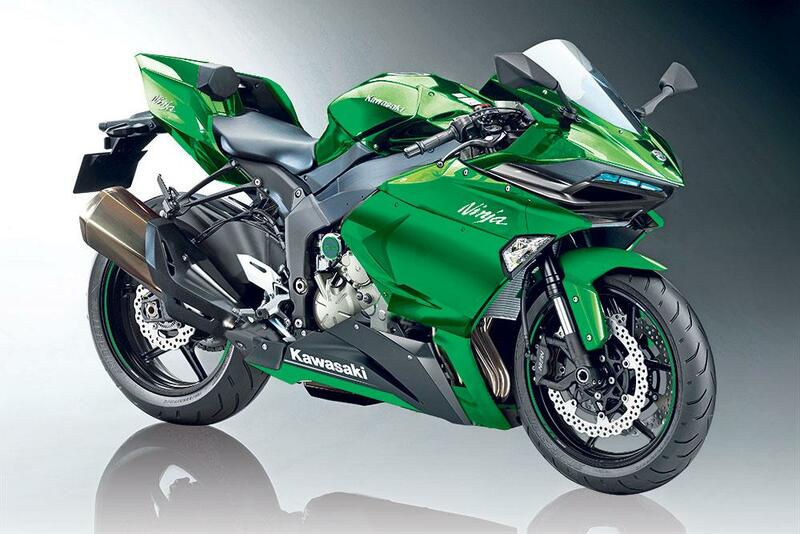 Rumours and Kawasaki trademarks suggest the new bike will be called ‘Ninja R2’. While the capacity of the engine has not been officially revealed, it’s expected to be a supercharged middleweight with a capacity of just above 800cc, and could provide a real alternative to the current crop of 1000cc superbikes. The Ninja R2 is a mouth-watering prospect, and evidence for the model is building. With no scope to race its supercharged engine technology, Kawasaki have the freedom to develop a mainstream bike without having to conform to conventional capacity limits or other racing homologation-led design decisions. Although our Japanese sources say Kawasaki are close to settling on an engine capacity of fractionally over 800cc for this model, a smaller capacity version could follow. That the engine should be smaller than that of the H2 hyperbike first seen at the 2013 Tokyo Motor Show is no surprise. At last year’s EICMA show in Milan, Kawasaki president Kenji Tomida revealed that the supercharged engine technology of the H2 – developed entirely in-house by Kawasaki – was always intended to be scalable to suit other applications. The Ninja R2 is just one of at least three models Kawasaki are believed to be working on using forced induction technology. Last year the firm revealed the SC-01 and SC-02 concept bikes, also giving an indication of how widely this technology may spread throughout the Kawasaki range. 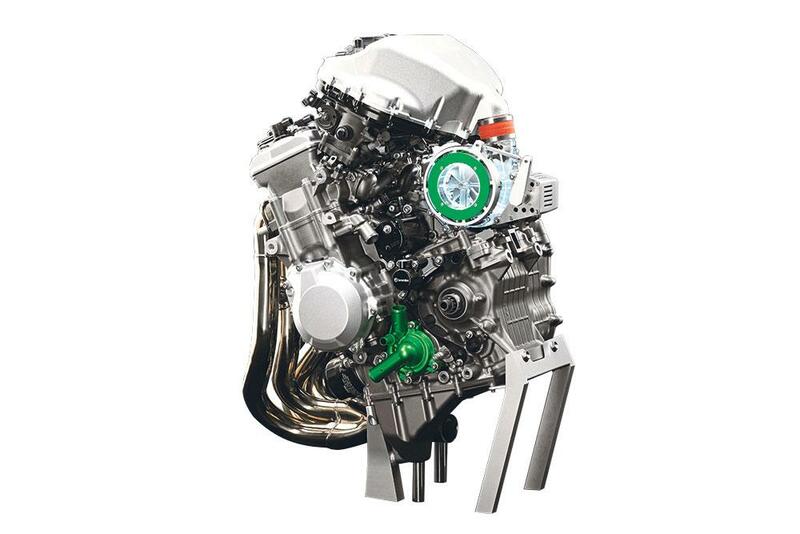 Also in 2015, Kawasaki unveiled the ‘Balanced Supercharged Engine’ – a second-generation supercharged four-cylinder motor that took centre stage at the firm’s Tokyo Show stand. While technical details are scant, we understand that this is the circa-800cc motor that will power the R2. The capacity, while considerably smaller than the 998cc H2, is higher than many were expecting, with rumours abounding of a 600cc supercharged engine being in development. But the 800cc design makes more sense. A higher, 800cc capacity won’t lead to an engine that’s significantly larger in its external dimensions and will allow it match naturally aspirated 1000cc superbikes for performance. While far more affordable than the H2, no supercharged four-cylinder is ever likely to carry a 600cc-sized price tag. It also fits neatly with Kawasaki’s own name for the engine. The term ‘Balanced’ is understood to define the motor’s mix of power and torque and the way it delivers that performance to the road. The big 998cc motor of the H2 was a statement of excess, particularly in its more extreme 310bhp H2R form, and a small, screaming version would be just as hard to ride. An 800cc variation allows for a fairly compact, lightweight motor that provides more than enough performance without needing to be tuned to the hilt and filled with the expensive components and materials that would entail. With fairly moderate levels of boost, something in the region of 190bhp and around 80ftlb of torque should be easily achievable. An integral element of its performance will be the variable geometry supercharger intake shown on the Balanced Supercharged Engine concept. It features radial electronically-pivoting blades that change pitch to alter the volume, speed and direction of the airflow into the supercharger, giving the engine management another tool to control the bike’s performance and economy. Other Kawasaki patents have also suggested that future supercharged models could feature a dual-speed supercharger, able to switch gears to alter its speed relative to the engine, and an intercooler to make the compressed intake air cooler and denser. However, the use of an airflow control system is an easier and cheaper way to achieve the similar power characteristics. The R2 name suggested for the new bike comes from a selection of titles that have been trademarked by Kawasaki in Japan. These names include Ninja R2 and Ninja R2R – suggesting that a higher-performance version of the new bike is also on the cards, just like the H2R. In terms of styling, our image takes its inspiration from the original H2 but also from Kawasaki’s future styling direction, which was hinted at last year by leaked images of the next-generation Ninja 300. The slanted, reverse-rake headlights with jutting spoilers underneath them are key to its bold new look. One big question mark remains over timing of the bike’s unveiling. If the timescale of the trademarking of the H2 name is applied to the R2, then this bike could be seen as early as the end of 2016, but our sources in Japan and Europe suggest 2017 is more likely.